Station Status: Available for in person and remote use. Contact the Club Station Team at stationteam@caraham.org if you would like to operate the station. The club station is available to members to explore DXing, contesting and casual station operation on the HF, VHF and UHF bands using SSB, CW, RTTY, PSK, packet and other digital modes. The club station's three main HF operating positions are named by tower location. The North station uses the north most 100 ft tower and the radio setup is next to the window. To the left of it is the South station which uses the south most 100 ft tower. Two locations to the left of the South station is the East station. It uses the 50 ft tower on the south east side of the lot. The club station VE6AO is activated during major contests, normally in the multi-single or multi-two categories and occasionally, multi-multi. The two main North and South stations consist of Yaesu FT-2000's and Alpha 9500 amplifiers. Heil boom headsets with HC-4 cartridges are used along with footswitches on SSB and Mircoham microkeyer USB interfaces to connect the radios to the computers and Bencher paddles for CW. Auto band-switched Dunestar 600 filters, using Top Ten band decoders, keep the inter-station interference to a minimum. W2IHY two band equalizers, with noise gates, keep the fan noise down between words. Yaesu u-tune filters allow greater selectivity on some bands during contests and crowded band conditions. 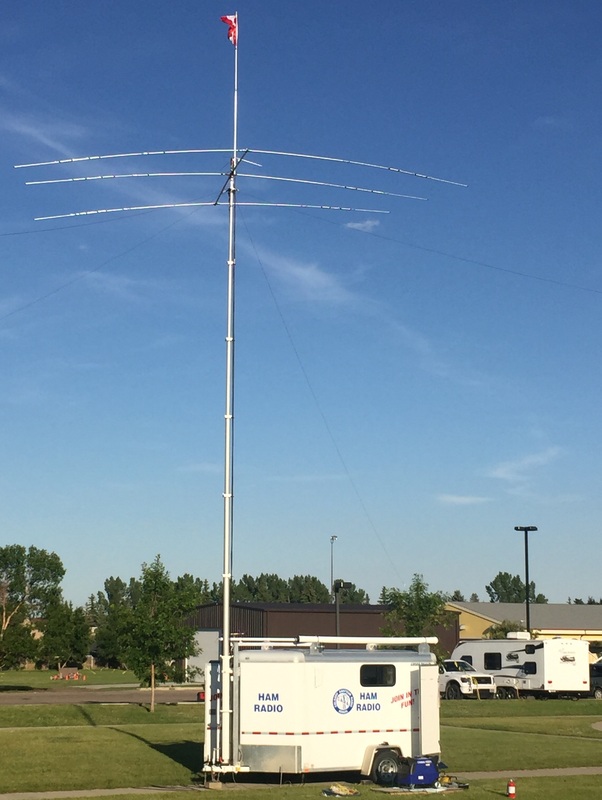 Antennas on North 100 ft tower are three independently rotatable Bencher Skyhawks for 10/15/20 @ 101ft, 60ft and 30ft and two Cushcraft 402 CD for 40 meters @ 110ft and 50ft. A WX0B 3 position stackmatch is used to phase the 3 tribanders and a 2 position stackmatch phases the two 40 meter beams. Tic ring rotors turn the middle and lower triband yagis as well as the lower 40 meter beam. An Alpha Spid rotator turns the top tribander and 40 meter beam. Five sloping broadband half wave dipoles for 80 meters on the south tower can be selected using a remote coax switch in the shack. A ring of 30, 100 ft radials are attached to the ground system to support shunt feeding of the tower, through a series capacitor, as a vertical on 160 meters. 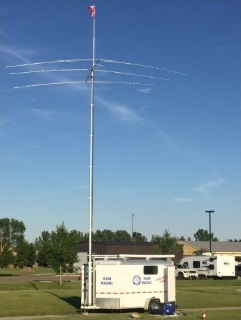 Antennas, rotors, radials and phasing boxes on the south 100 ft tower are identical to the first tower, except on 80m, where there is a vertical dipole 4 square using a Comtek 4 square box. Another 2 port WX0B stackmatch allows the antennas on both towers to be combined and fed in phase the single operator mode. A pair of relays switches the North station from the two operator to single operator configuration, resulting in 6 tribanders on 10/15/20 and 4 2 el monobanders on 40, with 40 M spacing between the two stacks of antennas. The two towers, ¼ wave apart, can be operated as phased verticals on 160 meters using a WX0B 160M phasing box. The third HF position is known as the "East" station. It has an FT2000 radio. When switched to antenna 1, it is connected to a Yaesu FL7000 amp. Selecting 10,15 or 20m switches to a System One tribander on a 50 ft tower. Selecting 40 or 80m connects to a Alfa Delta DX LB in an inverted V configuration. Setting the FT2000 to antenna 2 selects our 40m 4-square array. In addition to HF, there are two VHF/UHF stations. A variety of radios are available with vertical antennas are on the 100 foot tower, and directional antennas on the 50 ft tower next to the clubhouse. One radio, an FT847 is also remote controllable for operation on 6m, 2m and 70cm. The station has 5 networked computers for logging using N1MM contest logging software. The operating positions normally connect to the local packet cluster through a cable Internet connection, thereby providing DX spots on the computer logging software for the band in use. Wireless computer networking is available in the building and web cams monitor the doors and radio shack along with elaborate entry and security systems. Members and amateurs visiting Calgary are encouraged to contact the Club Station Team at stationteam@caraham.org to arrange a visit. In 1998, CARA applied to the Calgary Community Lottery Board for a grant and received a $15,000 grant, which was used to purchase and install the first 100' commercial guyed tower. Later funding has allowed development of the stations to their current state. CARA thanks the Calgary Community Lottery Board for its generosity and the Alberta Government’s Liquor and Gaming Commission’s charitable gaming program, for their continuing support. To gain access to the club station please download and fill out a key fob agreement. Members and non members can visit the station with out a key fob but will have to do so while a member with a fob is there. If you wish to use the station when other members are not on site you will need to fill out this agreement.